Several years ago, the city of La Vergne began holding an annual Veterans Day Ceremony – a beautiful tribute to the men and women who have served in our nation’s armed forces. 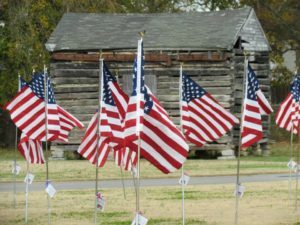 The past couple of years, residents have been able to purchase flags for $10 for the “Field of Freedom.” The flags are truly breathtaking when they’re set up. They are tagged with who the flag is honoring and the people who purchased the flags may take them home after the event. Don’t wait too long to order your flag! You’ll want to get one before the order is placed! Please join us in honoring all veterans by attending the annual La Vergne Veterans Day Ceremony on Saturday, November 11 starting at 11:00 a.m. The ceremony will take place at Veterans Park at the Memorial Wall. Rachel Sullivan will be singing our National Anthem. Speakers will include Mayor Waldron, Alderman Jones, and Army Veteran Chris Oakley. We will also be displaying flags for veterans and active duty members in our “Field of Freedom”. You may purchase these flags for $10 by calling the Parks and Recreation Department at 615-793-3224. Photo taken by Kathy Tyson. Photo from City of La Vergne Facebook page. "Flags Available for Field of Freedom", 5 out of 5 based on 1 ratings.